Pastor Morris places a strong emphasis on spiritual growth and leadership development among the ministerial staff and congregation. In an effort to address the spiritual needs of a diverse and growing congregation, new ministries were formed under his leadership such as the Marriage Matters, Special Events, Sunrise and Wellness ministries. The Men’s and Women’s Discipleship classes were formed to provide an opportunity for group fellowships and to address the educational and spiritual needs of the church. The Youth Church was expanded to include youth choirs, dance and mime ministries with the addition of the Kingdom Kids, Praise in Motion and Silent Praise. Semi-annual leadership development workshops are provided for the church leadership. Under the leadership of Senior Pastor Morris, Bethany Baptist Church continues its outreach to the local community. It is in the spirit of evangelism that the “We Are Family” festivals and “Back to School” events are hosted to engage the community in a fun, fellowship, and worship. Pastor Morris actively ministers to students attending Widener University and serves as an associate chaplain at the WU Interfaith Center. His love of God and His people shows through his undying passion to the ministry of mentoring and sharing what a difference it is to have God in your life. Prior to joining Bethany Baptist Church, Pastor Morris served as Pastor of Evangelism and Missions at Sharon Baptist Church in Philadelphia, PA; an associate minister at 19th Street Baptist Church in Philadelphia, PA and as Chaplain at Cheyney University of Pennsylvania. 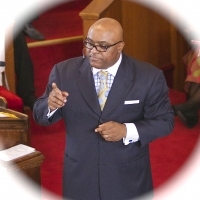 Pastor Morris is a native of Philadelphia, Pennsylvania, the youngest son of the late Lem and Emma Morris. He attended Cheyney University of Pennsylvania, majoring in Political Science as an undergraduate student and Administration as a graduate student. He has a Masters of Theological Studies from Palmer Theological Seminary. Pastor Morris is married to the former Kim D. Harris of Philadelphia; they are the proud parents of two children, Gabrielle Elise and Matthew Emanuel.